Wow! It’s June! Two questions: First, how the hell did that happen so quickly? 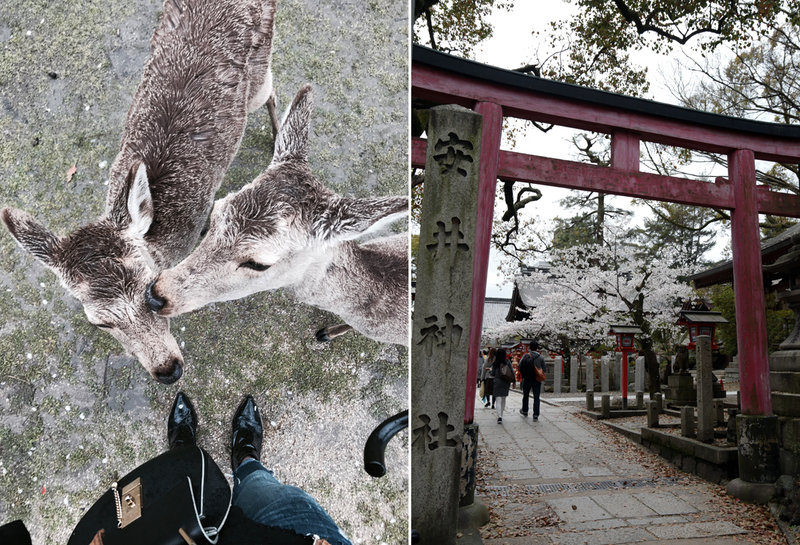 And secondly, are you guys cool to forgive me for my very delayed guide to Kyoto? 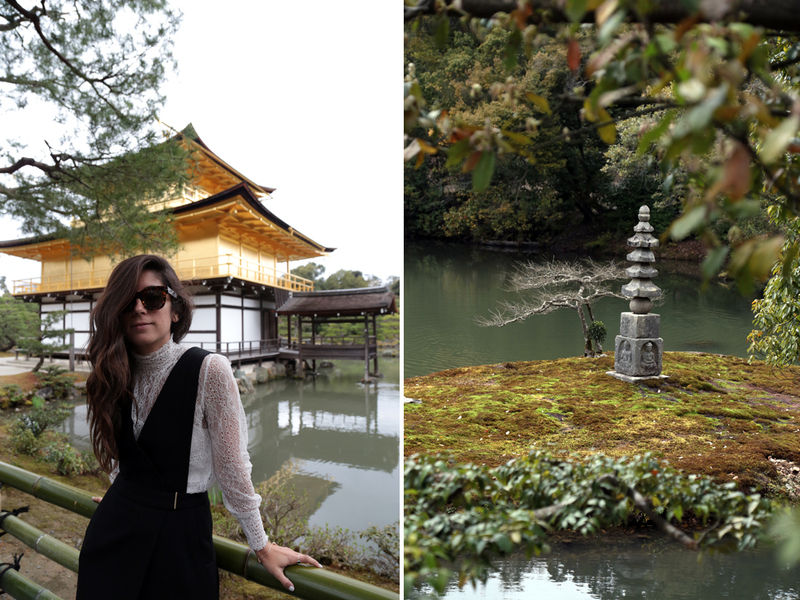 There are so many top places to visit in Kyoto!! I suppose this is where I should insert some sort of explanation for the tardiness. In all honesty, I thought I had started off strong with my Tokyo guide back at the beginning of May. Admittedly, life got a bit in the way (as it always does), not to mention a few other trips, none of which I’m complaining about — but it has been weighing on my mind a lot lately. I want to make sure I’m prioritizing these trips in a timely manner for you guys, so they can be as fresh and as relevant as possible! 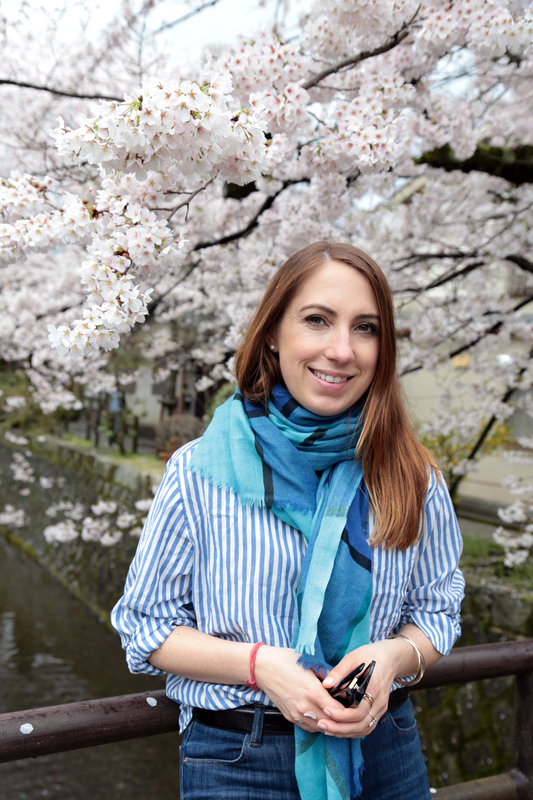 When it comes to Kyoto in particular, I wanted to knock this one out of the park for a few reasons, but namely, Kyoto was my favorite stop of the trip. From the people, to the food, from the numerous temples to the adorable neighborhoods, I could easily see myself living there in a heartbeat, if I wasn’t fussed about learning a whole new language, of course. 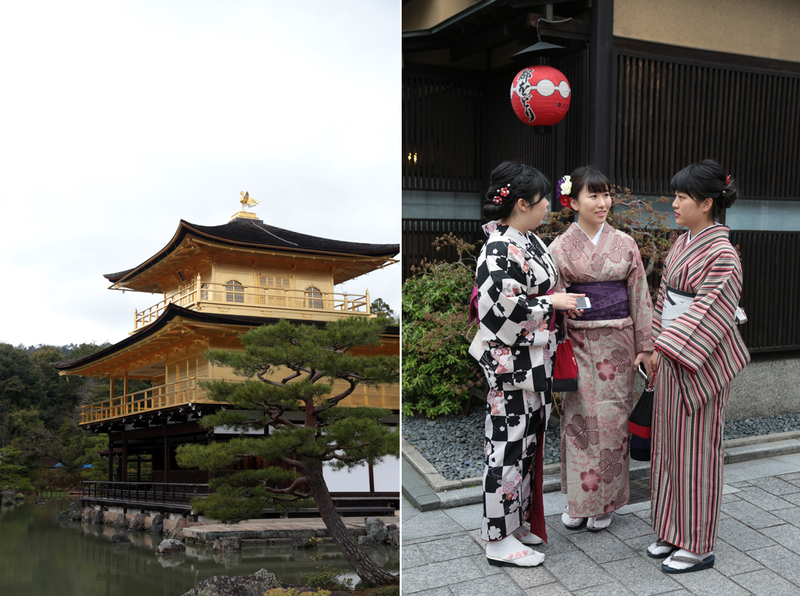 So without further adieu, let’s dive right into Kyoto, shall we? 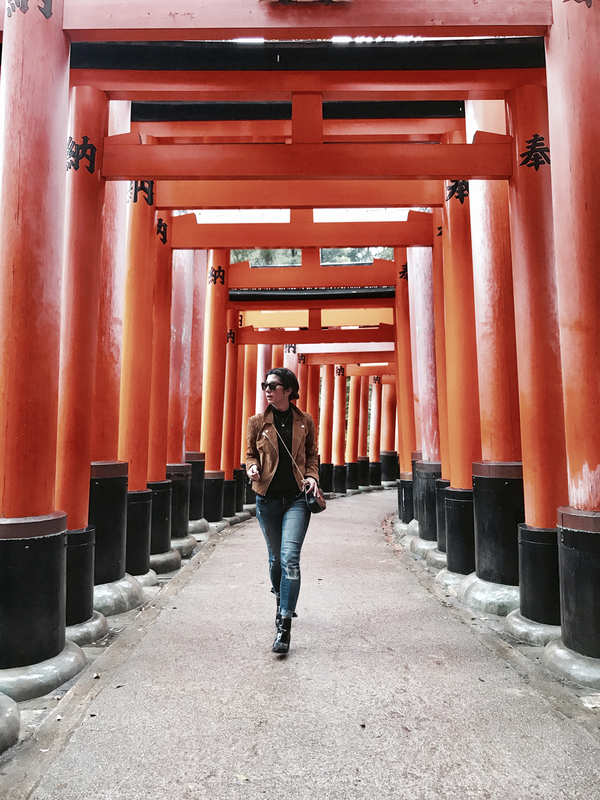 Also, if you’re just joining now, make sure to check out my post about Tokyo, where I also included a few pointers you’ll need to know before heading to Japan. 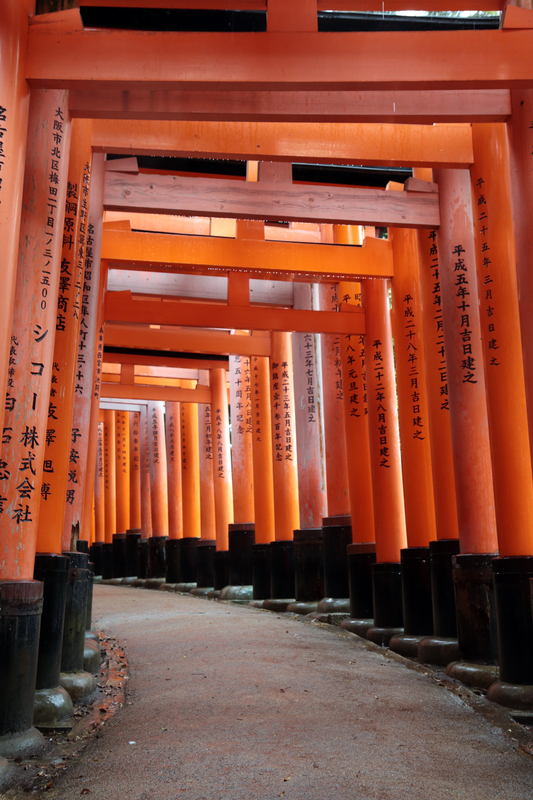 Fushimi Inari-Taisha: Raise your hand if this is one of the first spots you think of when visiting Kyoto. (Raises hand.) 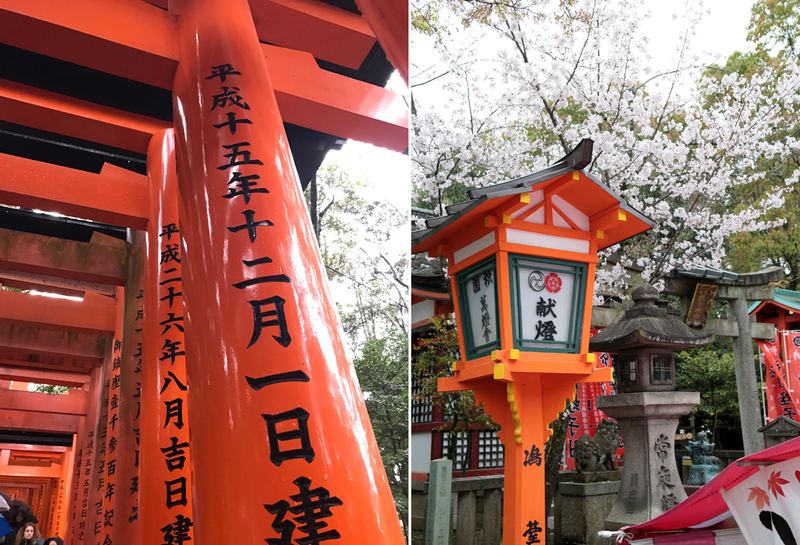 Yep, I think it’s pretty fair to say this temple (which boasts walkways covered by over 10,000 orange torii gates), gets a lot of foot traffic (pun intended). Is it worth it? 10,000 over, YES. Again, pun intended. Just a heads up, you’ll have to be patient to get a photo that’s relatively empty of people. Heather and I waited (in the rain, mind you), for over 20 minutes at a time just to get a clearing. 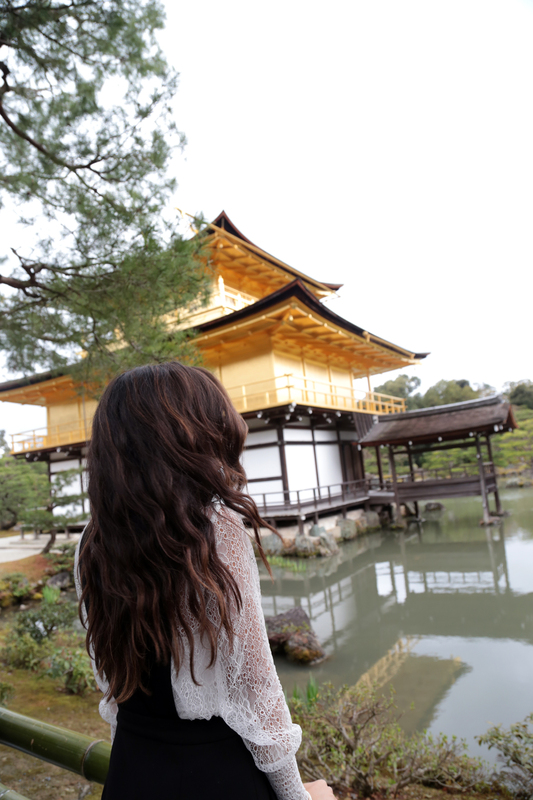 Kinkaku-ji (The Golden Temple): Aside from Fushimi, The Golden Temple was among my favorite temples of the trip. Why? Well, I think you all know by now, I’m a sucker for gold. And the entire roof of this temple, fittingly enough, is covered in gold leafing. It’s surrounded by a stunning lake, which makes for some beautiful reflection shots. 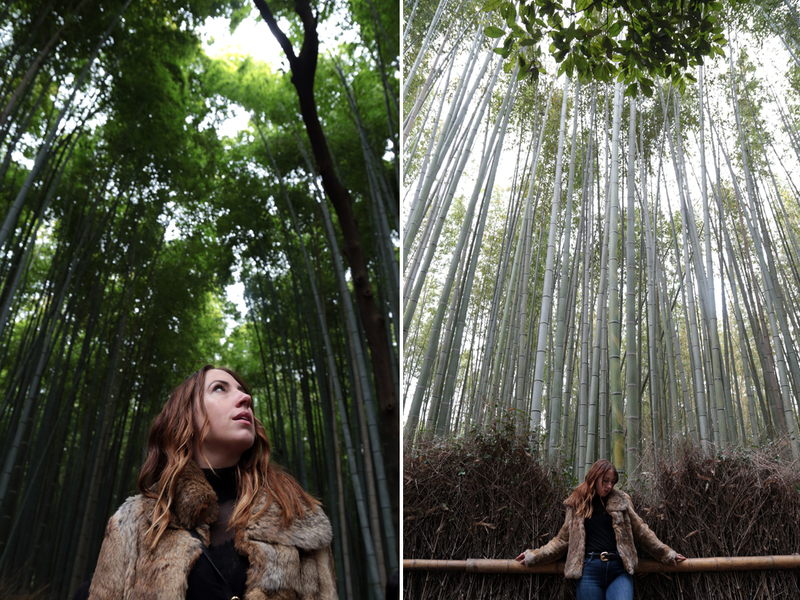 Arashiyama Bamboo Grove: This is going to be an awfully embarrassing comparison to make, but I think it’s spot on. Does anyone remember the movie Fern Gully when they were little? 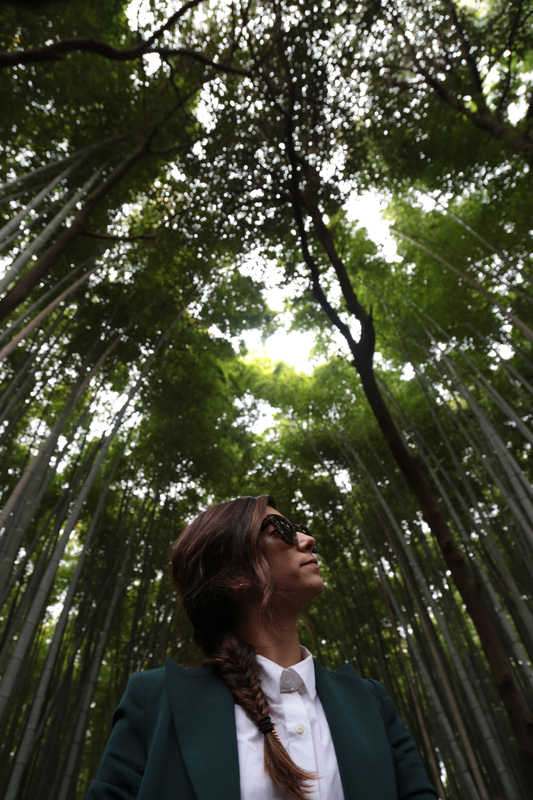 Granted, we’re talking about a bamboo forest here, not a rainforest as the movie depicts, but there’s something about walking through this forest that makes you feel like you’re lost in another world. 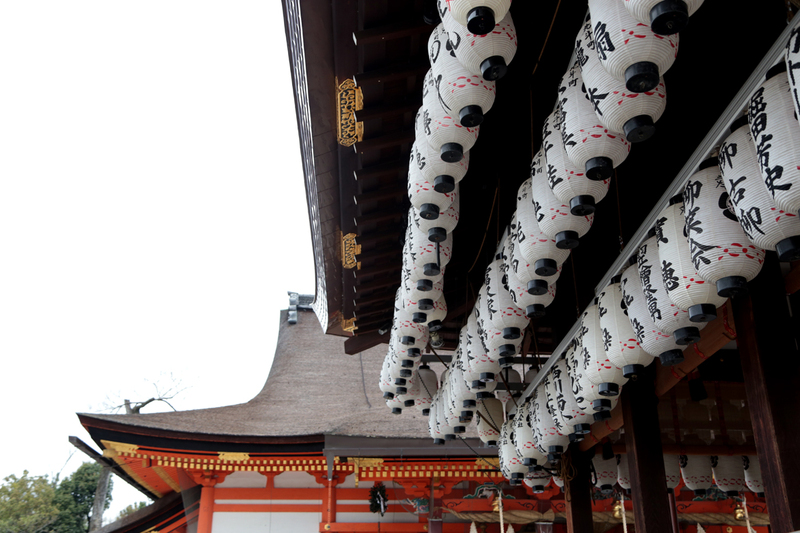 Kiyomizu Dera: Unfortunately, this temple was under construction while we were in town and will be undergoing renovations until March 2020. You can still visit, but much of it is under scaffolding, making photos a bit less than ideal. 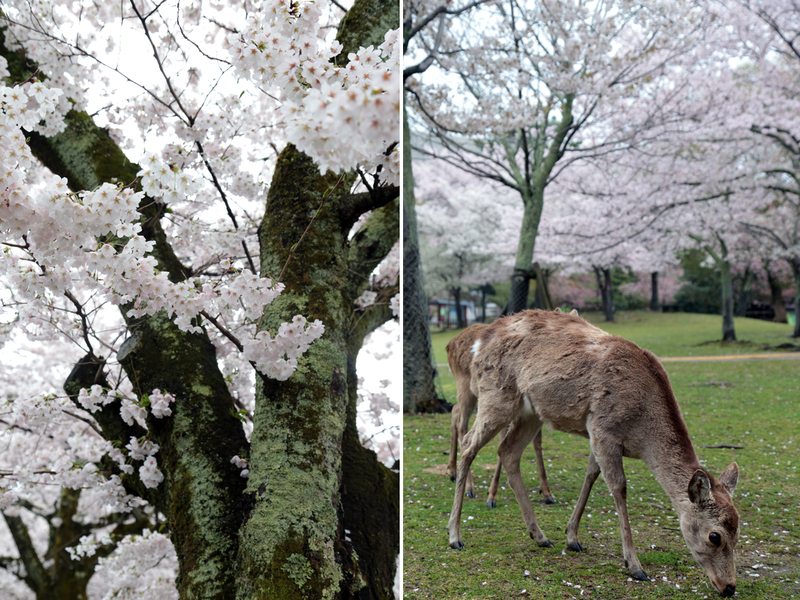 The grounds and surrounding gardens seem worth the visit, although we eventually decided to skip in order to head to Nara Park. Geisha spotting: Sigh. 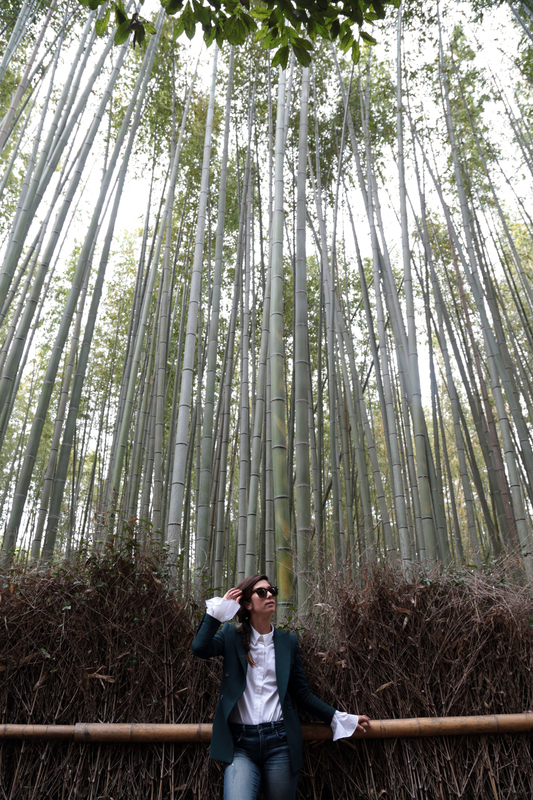 What I wouldn’t have given to have a geisha spotting during the trip! I guess I can’t say I was surprised though. 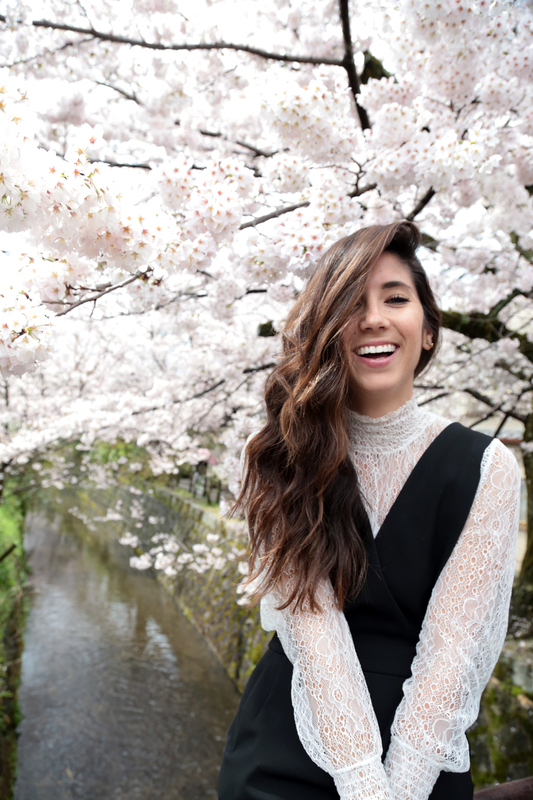 Every article I read said geisha spottings are rare and you have to be quick and in just the right spot at the right times to maybe catch one of them on their way to meet clients for the evening. This write up was extremely helpful though. 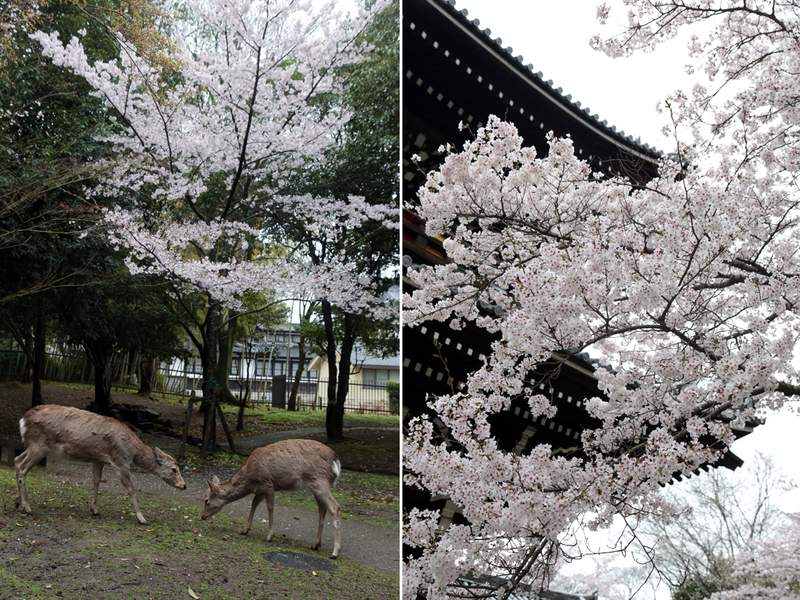 My two cents: hang out in Gion on Hanami-koji-dori around dusk/early evening, on a weekend if you can swing it. 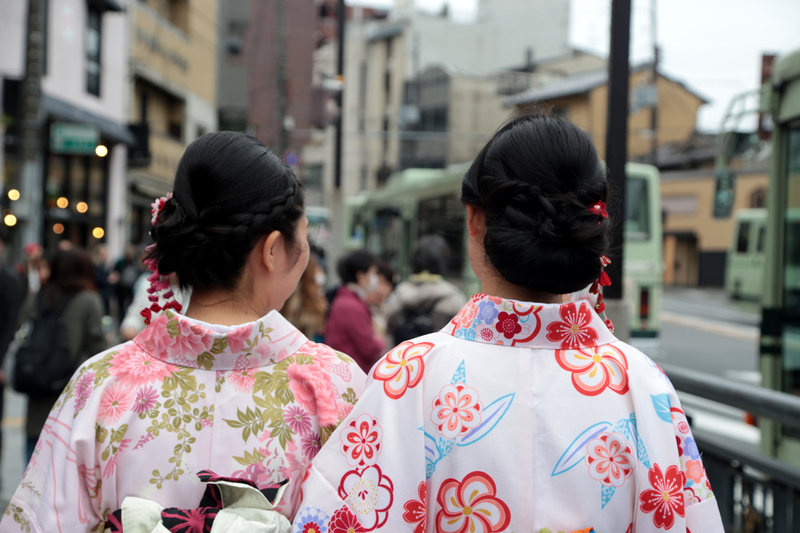 And if all else fails, you’ll end up seeing some adorable mother/daughter duos dressed up in their kimonos. 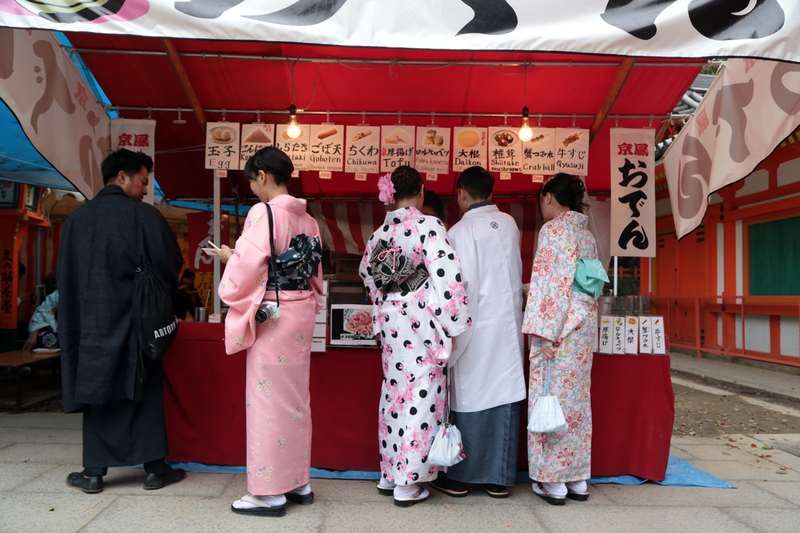 Nishiki Market: A long, open air market with so many different kinds of vendors. We didn’t have time to properly shop through here but it seemed like a fascinating collection of food and artisan work. 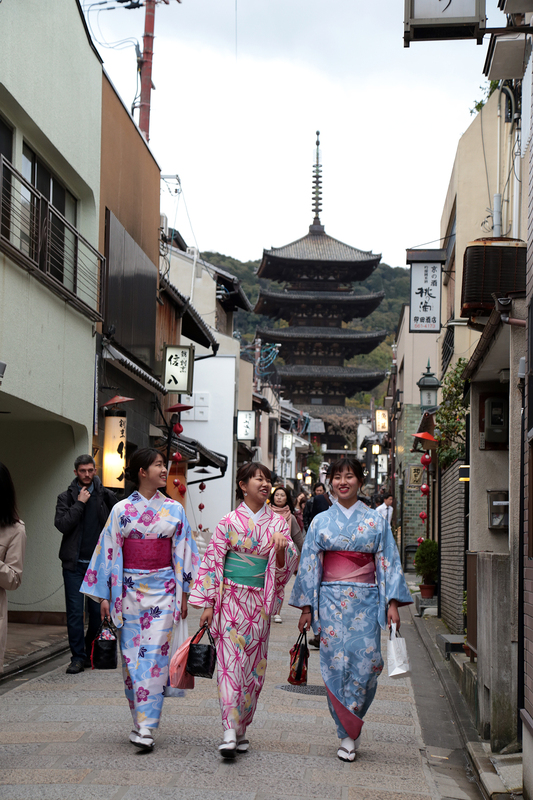 Shopping in Gion: As you’ve probably guessed by now, Gion was one of our favorite neighborhoods and the shopping had a lot to do with that. If you can, give yourself a day or half day to just stroll around and window shop. 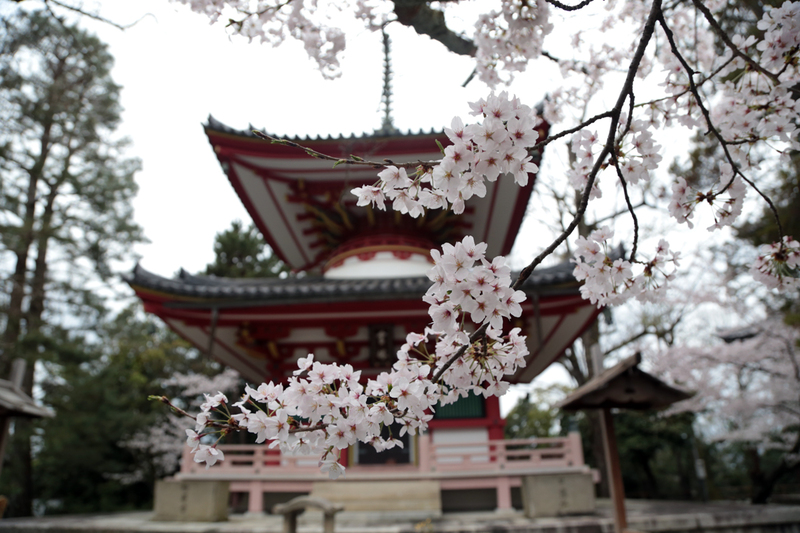 You’ll see everything from fan shops to kimono shops, from ceramic stores to tea houses. 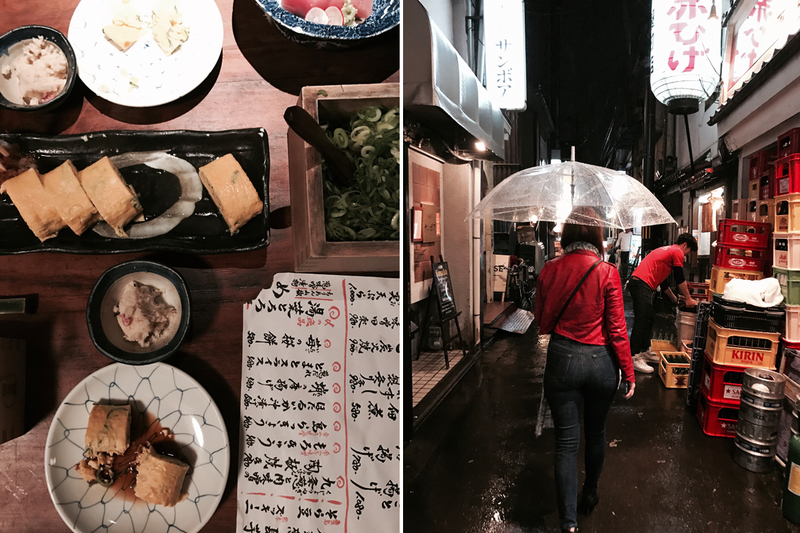 Heikichi Takasegawa: This was the perfect dinner to kick off our stay in Kyoto. 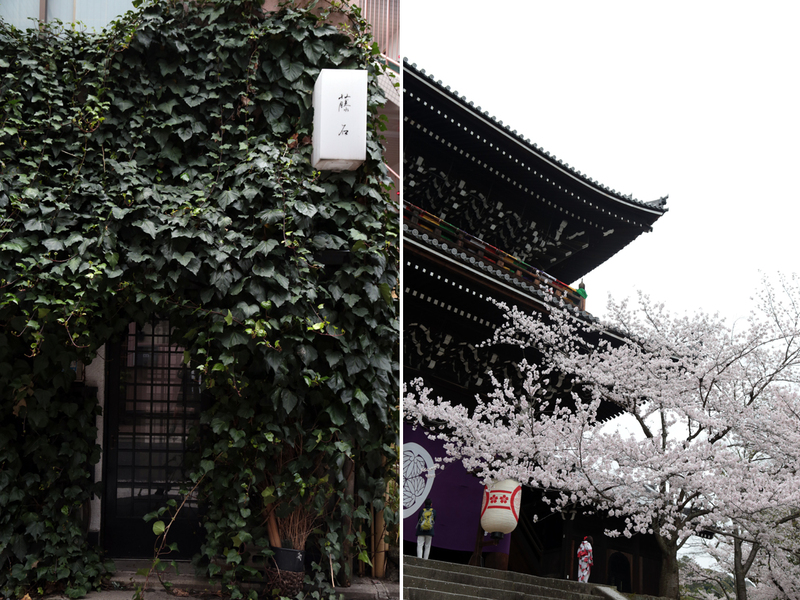 Situated in Pontocho Alley (which I describe below in the cherry blossom section). Very traditional Japanese restaurant and cuisine — we took off our shoes at the door (I noticed we did this far more often in Kyoto than Tokyo) and sat cross legged on the floor (SUPER comfortable — I’m kinda into dining this way now!). They’re known for their green onion dish, which Heather and I agreed, was one of our favorites. Go early, if you can, it gets quite crowded. Rest assured, it appeared to be a lot of locals joining for dinner that evening, which is always a relief! Bar Cordon Noir: If you’re a whiskey gal like me, you’ll appreciate all the Japanese whiskey at your disposal around Kyoto. 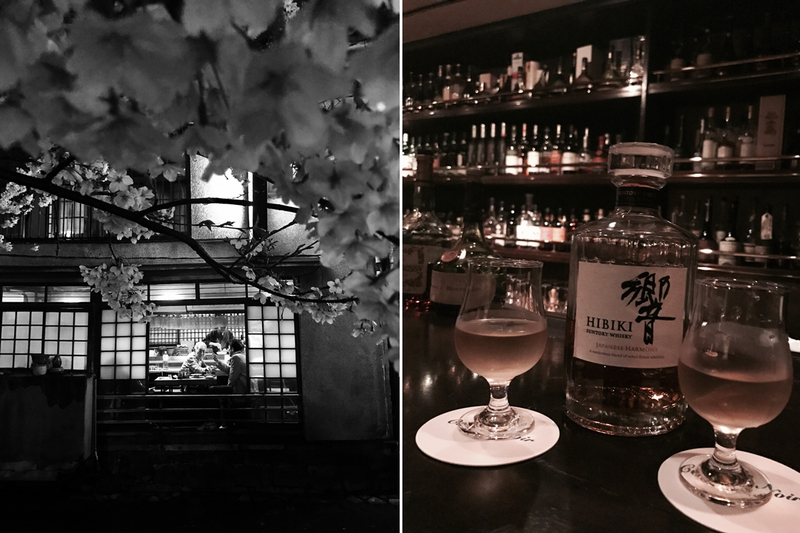 We popped into Bar Cordon Noir after our dinner at Heikichi and it was perfect night cap for a rainy, drizzly day. I highly recommend Hibiki whiskey — extremely smooth and surprisingly light, in a refreshing way! RAMEN everywhere: So I have a confession. We may or may not have gotten addicted to ramen at this point of the trip. Seriously. I can’t tell you how many times we looked at each other, when planning our next dinner move, and we secretly were hoping the other would just cave and say, “Ramen, again?” Good news is, ramen places are pretty ubiquitous, so they’re easy to find. And most are excellent. Tea ceremony: Perhaps a bit touristy, I actually really loved taking an official tea ceremony class. 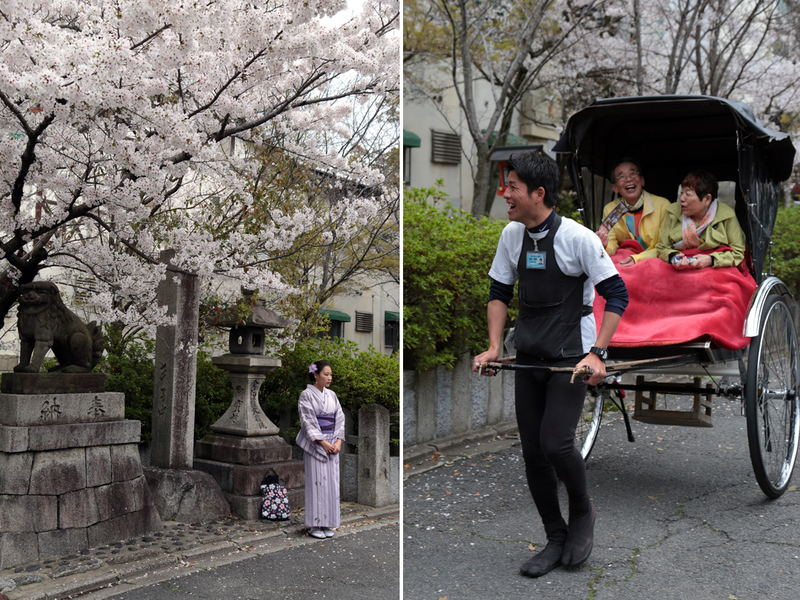 They walked us through the steps, traditions and even had us make (and whip!) our own green tea. We went to a tea house in the Gion district (the name of which is escaping me, so I’m bugging Heather at the moment to see if she can remember, stay tuned!). Green tea soft serve ice cream: I mean, who can say no to green tea flavored anything, let alone, ICE CREAM? Not this girl. 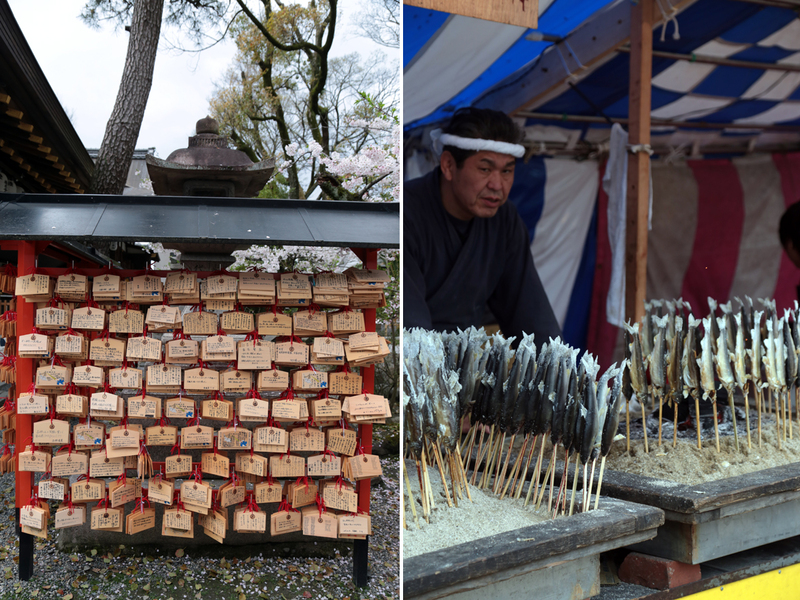 The vendors are pretty common and you’ll usually find a bunch of them near popular temples. Kura Kaiten Sushi (conveyer belt sushi): I’ll be the first to admit, I had my reservations about this. Something about seeing my sushi pass me by on a little plate didn’t exactly scream FRESH to me. 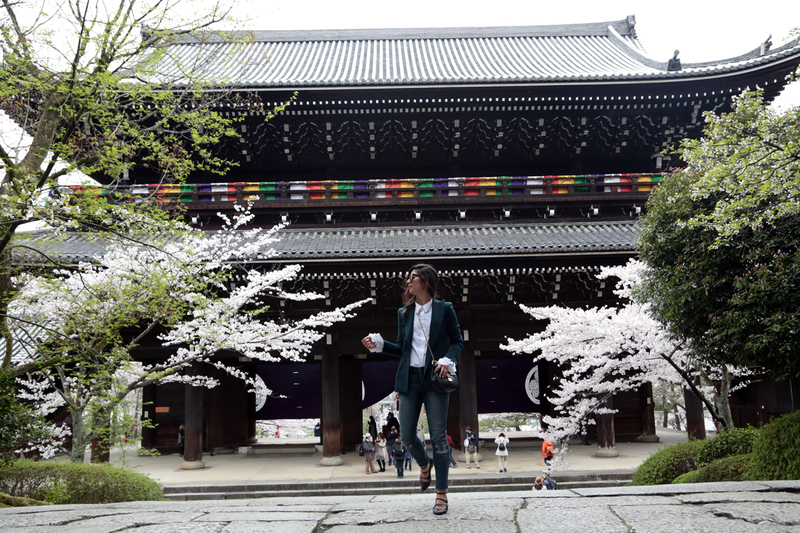 But after seeing crowds of people head to this spot after leaving Kinkaku-ji, we figured it was worth a shot. And I’m so glad we did. First off, to set expectations, it’s run very much like a fast food joint. Think In N’ Out line and number system. Next, that sushi isn’t on the conveyer belt for very long. We literally could peek inside the kitchen to see each piece being made before it was set out on the belt — seconds later, it was grabbed by a hungry customer. We got in the spirit of it and decided we had to move faster if we wanted to eat. We cleared at least 20 little places between the two of us! Tempura Endo: Arguably, one of our fancier meals of the trip, it also was one of our more adventurous ones as well. We’re talking heads and eyes and tails and fins and some things we couldn’t translate no matter how hard we tried via our Google Translate app. But! It was delicious and fun. I think Anthony Bourdain would be proud of us. Japaning Hotel OXA: This hotel was our home base the entire time we were in Kyoto. It’s conveniently located (most major subway lines and bus lines were nearby) and there were at least 3 different ramen spots within 2 minutes walk in any direction. Plus, it was more of an apartment set up situation, which was a nice change from our tiny little room in Tokyo. 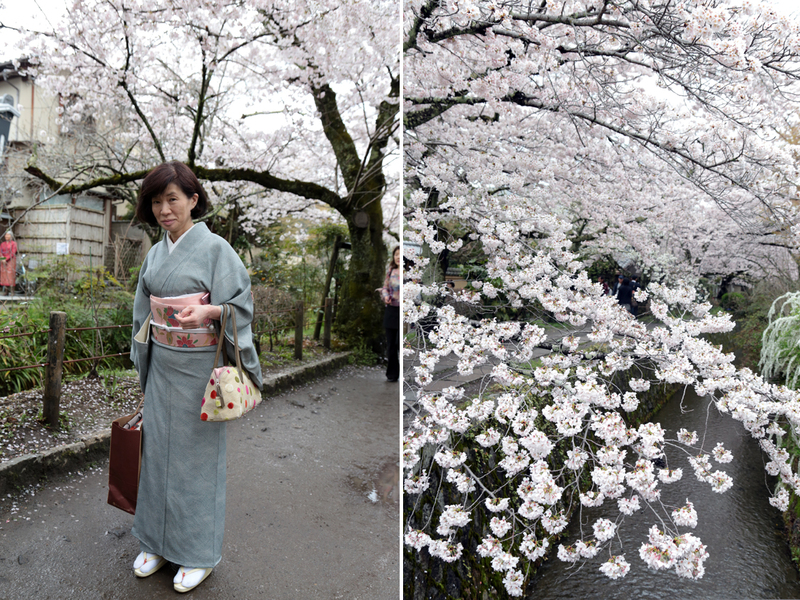 Philosopher’s Walk: Hands down, this was my favorite cherry blossom spot of the trip. 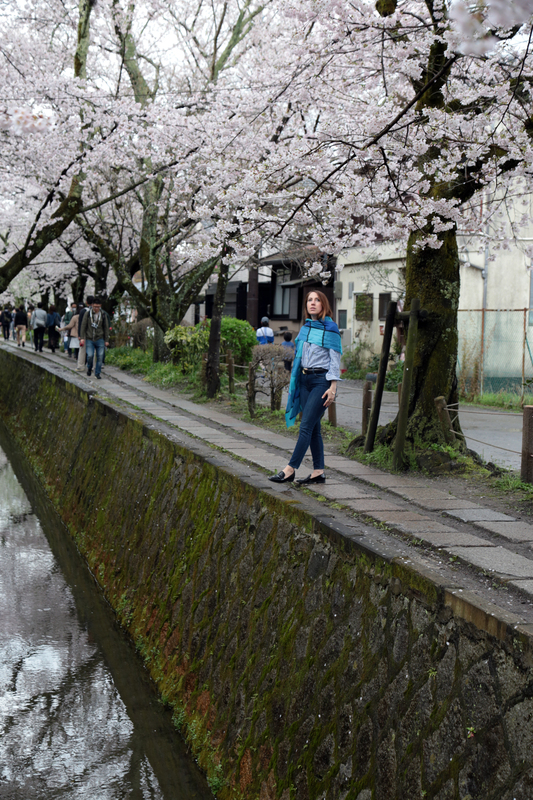 Tucked away in a more residential part of town, Philosopher’s Walk is a winding riverside path, canopied by cherry blossoms on either side of the river. It’s a bit of a trek outside of the city center (tip: we took the bus everywhere and it was surprisingly our preferred method!) but once you get there, you’ll immediately understand why it’s my favorite spot. Charming. Quaint. Quiet. Peaceful. 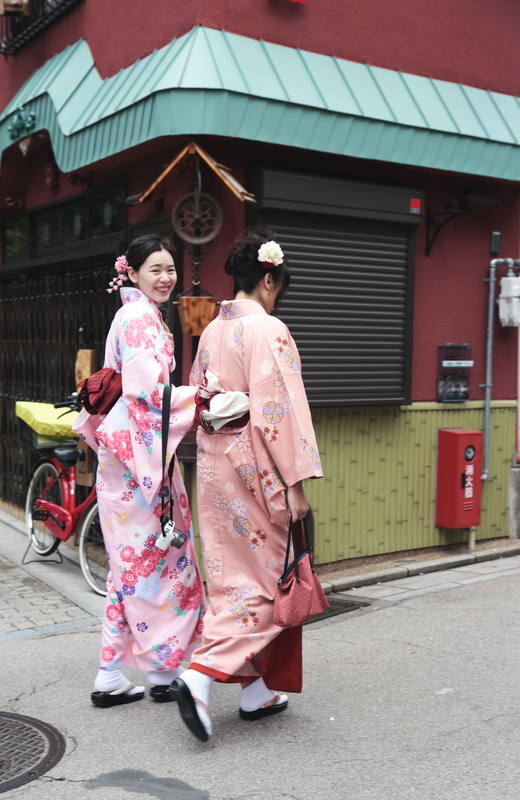 And don’t get me started on all the adorable mothers and grandmothers in their traditional kimonos casually walking to work. Plus, there’s a decent amount of pottery and ceramic studios along the walk, perfect for unique souvenirs. Pontocho: This alleyway runs parallel to the Kamo-Gawa River between Sanjo and Shijo. We actually walked along it on our first night in Kyoto as we were heading to dinner, only to have it start to really rain on us while we were en route. Luckily, we both had umbrellas with us, so we were able to really enjoy just how cinematic everything looked. Isn’t it funny how rain can really do that too, in certain situations? Each scene around us felt like a stolen moment from a movie. 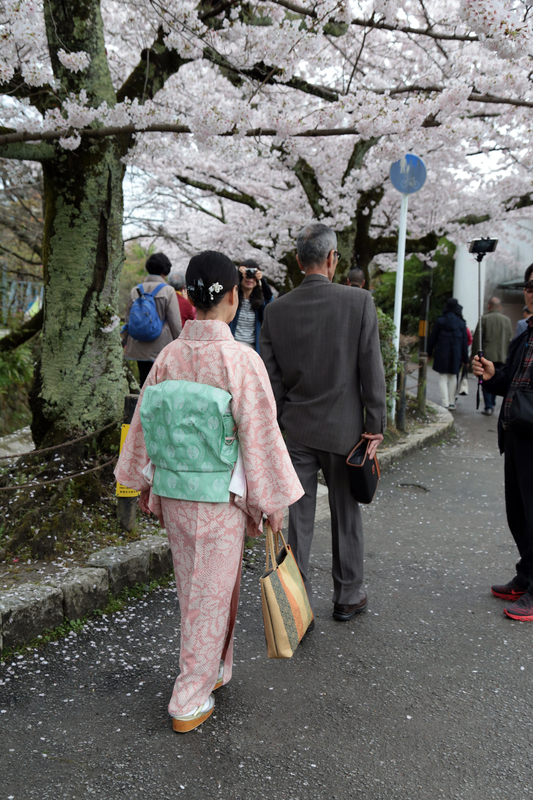 Couples huddled under their umbrellas, stopping every once and while to appreciate the cherry blossoms overhead. Late night dinner patrons enjoying the last of their sake before saying goodbye. If you can, try to walk around this area at dusk or early evening — I snapped some of my favorite photos of the trip in this spot and I credit that to just how beautiful the fading light looked in this area. 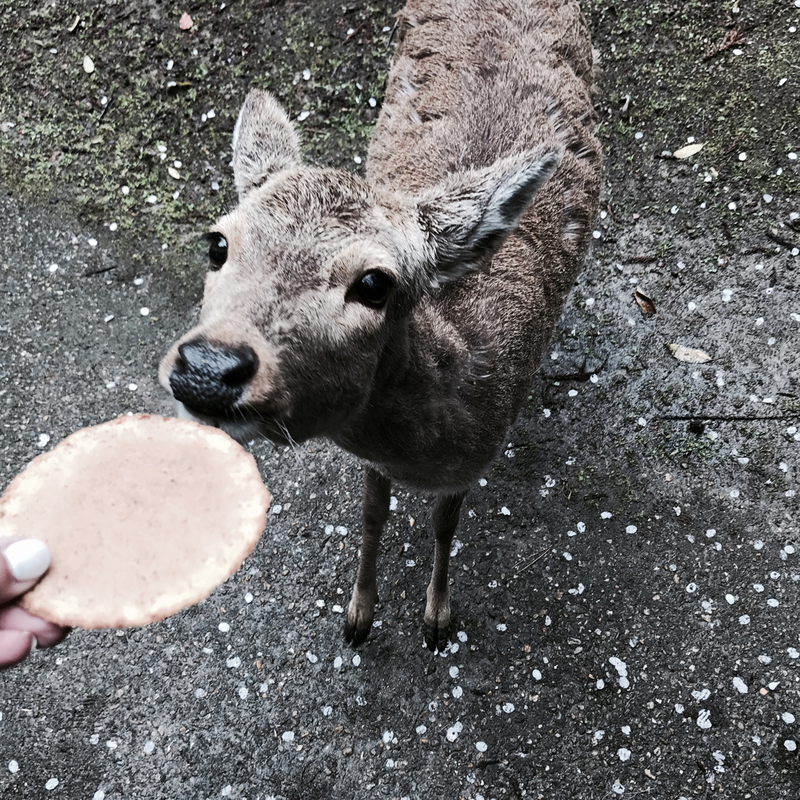 Stay tuned — Naoshima and Hiroshima recaps are coming soon! Oooh!!! You look too good. 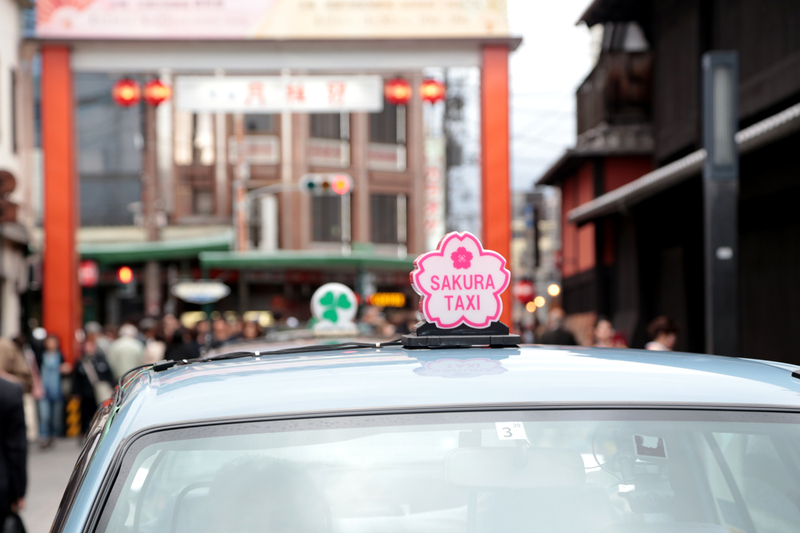 This is a quite comprehensive article, I feel like I have now been to Kyoto after reading this . Excellent post! Thank you for sharing. 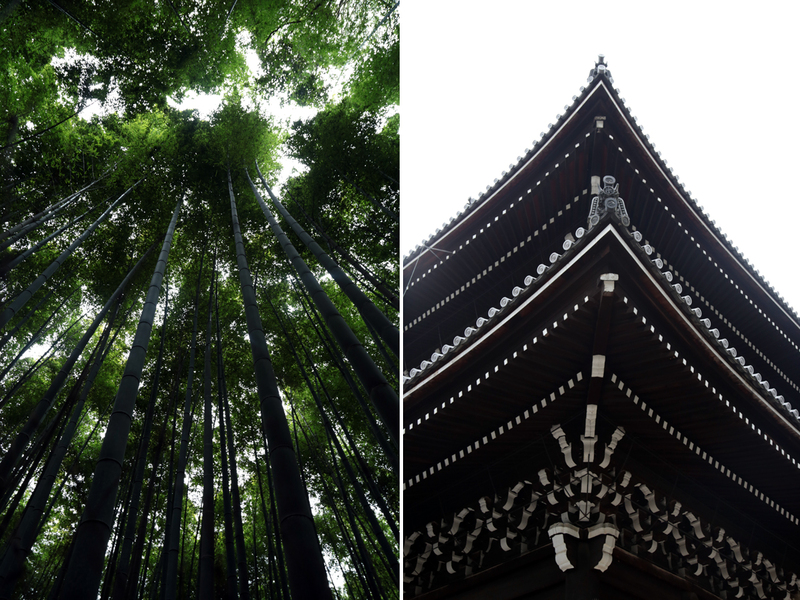 Kyoto is on my radar for travel this year. 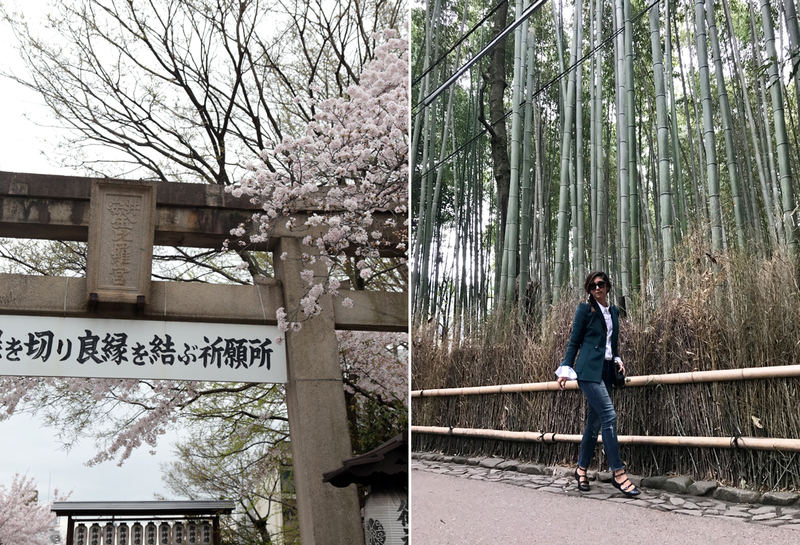 No trip to Kyoto is complete without visiting the Bamboo forrest or the gates that were in Memoirs of a Geisha! And I love how I see the Whisky in there! Good on you. That is my husbands fav. 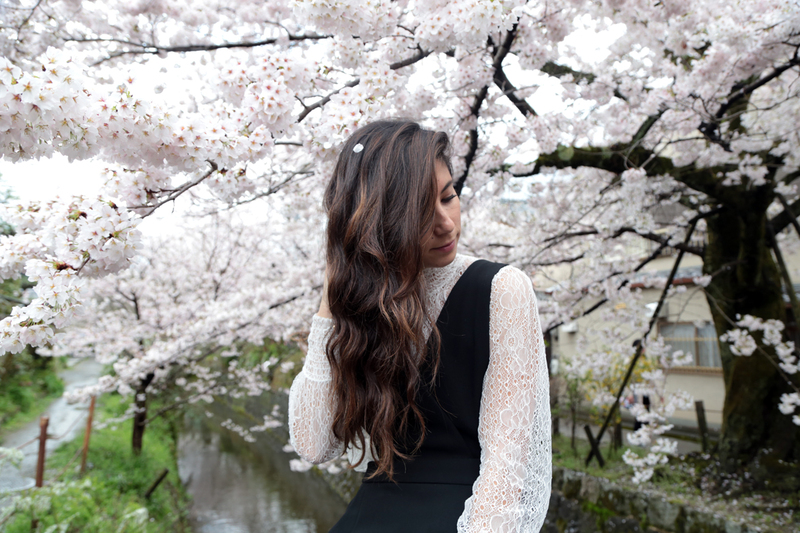 I love the first outfit – a jumpsuit and lace top.